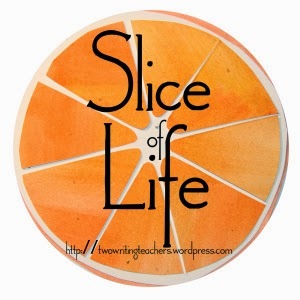 I am so very grateful to Two Writing Teachers for hosting Tuesday's Slice of Life. Please stop by their site to read other slices and leave a comment if you wish. I'm not sure where tonight's post will go, but it's one I must write. My parents spent their 53rd wedding anniversary in the hospital today. My mom, in the hospital for the first time since she had my youngest sister in 1967, was admitted yesterday for unexplained pain that was so extreme she couldn't walk. Today's been an emotional roller coaster as we dealt with a brusque doctor, understaffed nurses, who were very kind, and not knowing what's wrong with Mom. I've never seen my mom in so much pain or so helpless. It's not a fun place to be. My dad, sister and I rallied through the day and by the time I left tonight, Mom was comfortable and feeling a little more confident maneuvering a walker. The day was saved by the orthopedic surgeon who spent time with us and answered all of our questions. As I was saying goodnight, Mom's roommate, Helen, called me over. Her arthritic hands clasped mine and said, "You have a love family." I misheard her and replied back, "Yes, we are very loving." She corrected me and said, "No, you have a love family. I can tell your family is grounded in love." And she's right. We are grounded in love. But there was so much more love going on today than Helen could see in Room 548. The love I felt today extended far beyond the three of us in the room with my mom. And that's what I want to write about tonight. My update texts and phone calls with my sister in Florida, husband, cousins, and uncle have been filled with frustration, worry, and then laughter. Thank goodness for them. Each of them was there to listen and offer support, and relieve the tension with a little humor when necessary. My forever love family. It's the last week of school. We had lots of loose ends to tie up and my plans were all in my head. Wendy, one of my subs that I can always rely on, stepped in for me this morning with no hesitation. I left very loose plans and I never worried once that things wouldn't be ok. Sarah, our intervention specialist who does inclusion with me for writing workshop, had the afternoon taken care of and has taken control of our writing celebration which will be held tomorrow. Kate, Kathy and Nicole, my 4th grade teammates are filling the holes in my plans for the next 2 days as I sketched out very rough ideas. My principal, Kayla, told me not to worry ~ family comes first. All is well at school. The parents of my students have been kind and understanding and have assured me that the end of the year party will go off without a problem. One of the moms even emailed me to tell me how much her son enjoyed the afternoon sub, an older gentleman who I do not know. He's a veteran and he shared some very interesting stories with the kids. Since he will be in my room for the next 2 days, I was relieved to hear that the kids liked him so well. Joyce, our music teacher has been texting me with lots of encouragement and so many friends have sent love and prayers through Facebook. My love family at Scioto Darby and beyond. I am eternally grateful for each and every one of these people who are an integral part of my love family. To me, having people to love and support you no matter what is the most important thing in the world. I am thinking of you, Julie...ever since I saw your FB post. You are lucky indeed that you have a love family...and let's hope that your Mom feels better an is back home very soon. Julie, you are in my thoughts and prayers. I hope you find an answer to your mother's pain soon. What you do have is love and support, so important at times such as these. Hang in there! I've been thinking of you and wondering how things were, and of your mom and dad too. When it's needed, there is much love available, so true. I appreciate that you wrote to tell what's happening, Julie, and hopeful for everything to keep going "up". Sending lots of healing thoughts and prayers your mom's way. So glad that you are surrounded by so much love and support. It helps a lot in the hard times. I can relate and often have said our extended family and friends are a gift that we are given. Your mom is in my prayers. Oh, Julie, how wonderful that you're feeling a circle of love while you deal with such a difficult time with you mom. My prayers and positive thoughts go out to you!